Went up today to knock the rust off before tomorrow’s scheduled XC solo. 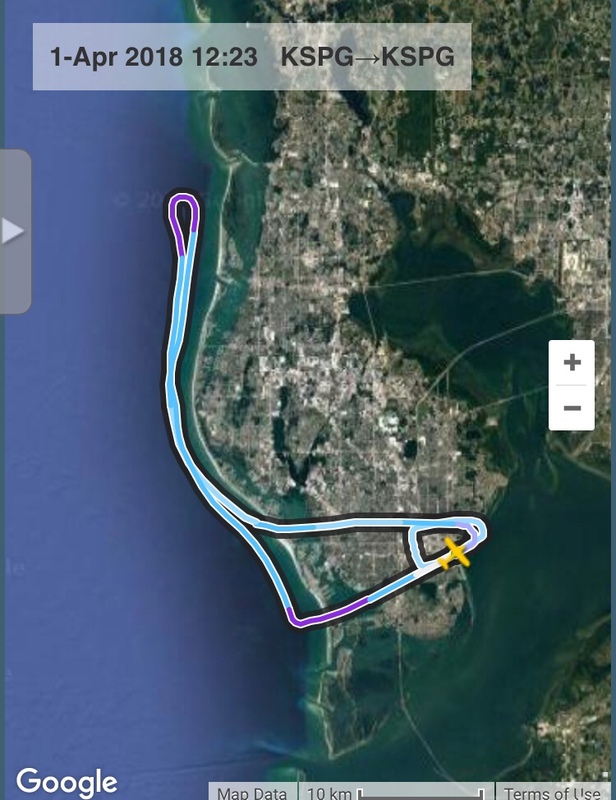 Today was my first solo hop in Tampa. It was intense – big boy airspace, traffic, and the door popped open on climb-out prompting some unintended pattern work – but it felt good to be in the airplane alone again. Weather permitting tomorrow it’s off to Ft. Meyers Page and Arcadia. Best of Luck tomorrow. You’ll do great! Just keep the blue side up, and if it don’t look good going down, remember you can always go around! It was fun flying together on PE yesterday! What happened to Arcadia and JSTRM?…Bon Chance mon AMI! Have a blast. It’s an unforgettable milestone! My daughter lives 2 or 3 miles west and just a little south of kspg. While I was visiting her Sunday I was out on her front porch at different times throughout the day I saw several small planes flying westbound and gaining altitude. One of those planes was probably you I saw. Cool beans! I see from your other post that you had a successful cross-country flight. Congrats!